If you were sitting in the grandstands of I-80 Speedway on Friday July 21st you saw a big puff of smoke appear from the pit lane. There was so much smoke that I heard many assuming it was from an expired engine on one of the haulers. That smoke quickly disappeared because it wasn’t an engine at all. 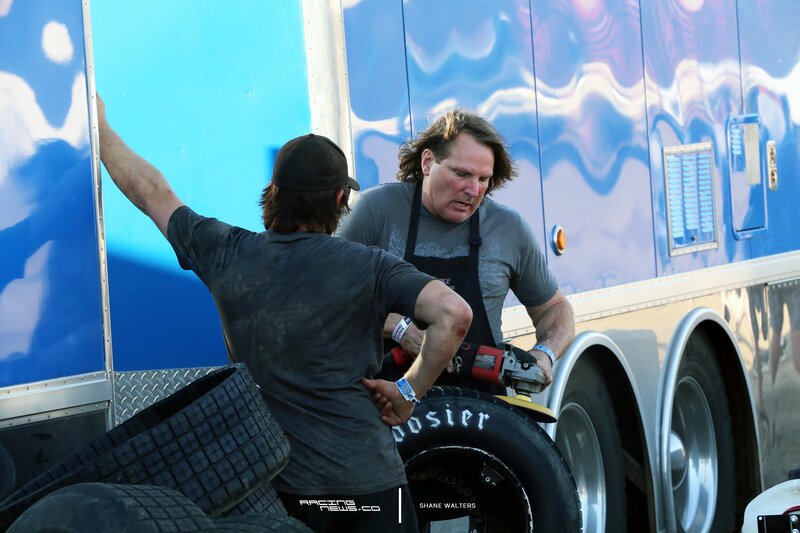 It was a an exploding racing tire at the Bloomquist hauler. The crew was setting the beads and airing the tires for the upcoming heat races. The air hose was hooked up and the crew went to working on other things. Unfortunately, that tire was forgotten about. Eventually, it buckled under extreme pressure. It exploded and shot off in the direction of the hauler wall. The photos here show the damage to the trailer from the outside, hours after the incident. Earlier in the day, it looked much worse. All the chrome side panels on the hauler were blown outward and upward. They were lifted, exposing the inside components to the trailer build. Highlighting the brute force of the tire explosion. Scott Bloomquist, “I’m just fortunate because I was standing right here.” He pointed 3 feet away and describes that his crew guy stood 3 feet in the other direction. As it happened, a Team Zero crew member was worried that the shrapnel hit Scott or anyone else. Despite the people count around the tire, there’s no injuries to be reported. Many of you have seen or heard of some scary incidents involving tires and pressure. I’ll leave those out of this story because I don’t want anyone to get the stories confused. I’ll simply say the headline on this story could have been horrible. After this incident, Scott Bloomquist went on to win 1 of his two heat races that night. Tonight, it’s the conclusion of the Silver Dollar Nationals. The B Main and feature event will take place at I-80 Speedway. The winner alone will take home a check totaling $53,000.